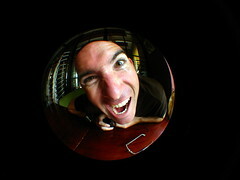 Without adue, footage of the final 1,200km or so of the longest journey by skateboard. You can watch it on the Vimeo video below, or see the Youtube version here: http://www.youtube.com/watch?v=O36qc1ufk9o. What’s the difference? On some computers, the Vimeo version can be a little jerky and slow loading. But, it is much better quality than the Youtube version, which loads quicker…nothing like more choices to make life more complicated, aye? I have really been enjoying spending time with Michele and other English speakers here in Shanghai the last couple of days. 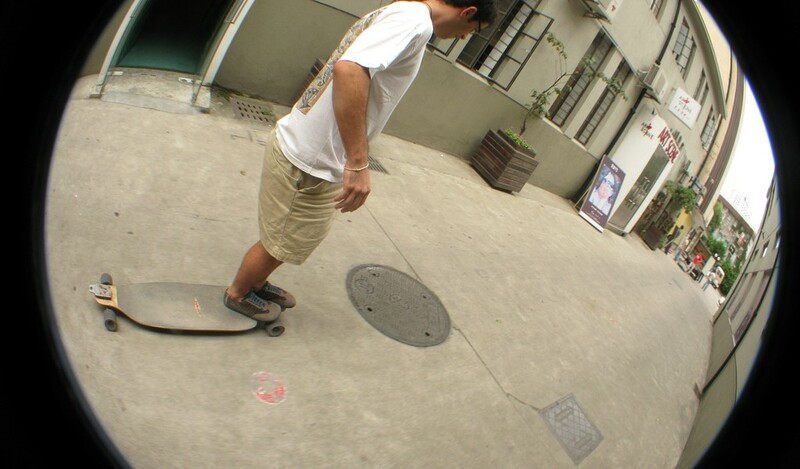 I have loved skating without a heavy trailer attached to my board. 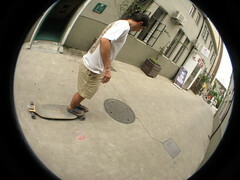 I have relished in spending some time cycling around central Shanghai while Michele skates on my board. I have devoured delicious western food. I feel revived with some cooler weather for a change. Rob, mate, dude: What a long, strange trip indeed. This journey will haunt the rest of your days. Super well done, and I look forward to a few posts from New Zealand as you get back in touch with home. You've done it, man. Congratulations Rob!!! Awesome trip, congratulation. Been following your trip for a long time. It has been a great read. I hope we will all get to be a part of another one of your adventures. WOW!!!! Congratulations! You made it!!!!! I look forward to all you future adventures! Gotta luv the change of transportation ! 😉 looks like that bike came out of the razor scooter factory haha..
And now some "cooling down" your muscles for three weeks on your recumbent. Perfect way to end this journey. Welcome home Rob, take good rest and we'll see ya in good old New Zealand!!! You legend. You absolute legend. Well done, and thank you SO much. Your last video, well I'm done – that's me, I've been crying my eyes out for the last hour. Sort it out Hatwell, that's what I've been saying, but I'm so happy for you SO SO HAPPY! Congratulations Rob — what an achievement. I have appreciated your candor in these pages. Shaun (a 14 Degrees follower since the beginning). Well done, mate. I've been watching your progress, just before you left for Seoul. Enjoy some time of your life being in one place for a wee while. No doubt, if I'm not caught up on my own little adventure, I'll tune into your next big one, whenever that may be. "Some other beginnings come from some other beginning's end." WEKA! I am so EXCITED for you! How amazing are you and you've done? SO COOL! God only knows the impact you have left on the many people you have met over the course of your journey, and on yourself, it must feel amazing. What an unbelievable accomplishment!! Now I can tell all my friends the picture of the guy that has been hanging on my refrigerator HAS DONE IT! wooo! I've said this before, but from the bottom of my heart, YOU ARE AN INSPIRATION! congradulations, please write a book? nice one bro. very well done. I find it so funny when you say 'I've only got 60 K to skate' as to me that's a massive distance. However, when you think of what you achieved I can see where you're coming from. All the best for the rest of your stay in Shanghai and your trip down the length of NZ. May the locals treat you right and the wind always be at your back. Namida Namida Namida no Kandou desu! Hey Rob….awesome stuff one of the best decision in your life you can make……congratulations God has been with you all the way….I am inspired!!! Congratulations on reaching your goal. I have been with you for the past almost 2 years. You have opened my eyes to what is possible and thanks for the great reading and allowing me to live vicariously through your journey around the world. Will follow you through NZ, a country that I just loved visiting ten years ago. Take care buddy! Never doubted your journey would end successfully. Time for a well deserved break and the comforts of home. Great video, Rob, as per usual. You really do have lots of video footage to use for a documentary when you get back to the land of the long white cloud. 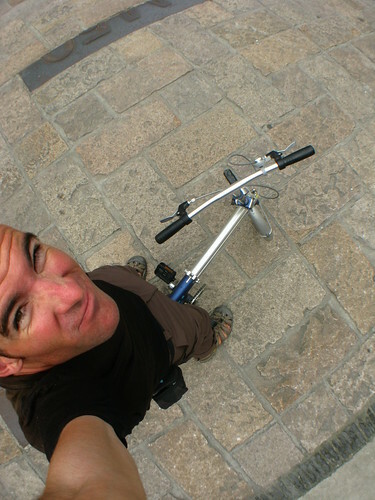 I'm a long time reader – I've been reading your blog since nearly the beginning of your trip. I've never posted a message, but I have checked your site diligently weekly if not daily over the past two years. Your adventure has been inspirational, educating, exciting – I could go on and on. I just want to congratulate you and thank you for sharing such an amazing adventure. congrates on one hell of a mission! Have enjoyed following your trip. Come back to Dunedin soon! I have enjoyed reading and being apart of your epic trip. 14degrees Off the Beaten Track is my (Rob Thomson's) online home. I live in Sapporo City, which is in Hokkaido, Japan's northern-most island. I am a guy with a day-job as a professor at Hokusei Gakuen University, but I like to explore new places and share the experience. I still haven't found the bottom of Hokkaido's enchanting depths. Cycle touring and backcountry ski touring are what keep me occupied here these days on my days off. Previously I cycled from Japan to Switzerland via Central Asia, and I hold the Guinness World Record for the Longest Journey by Skateboard (12,159km). As indicated in the Hokkaido Snowy Mountain Guidebook (Hokkaido Yuki-yama Gaido – ISBN: 978-4894538047). Difficulty as assessed by the Hokkaido Snowy Mountain Guidebook, p. 10 (Hokkaido Yuki-yama Gaido – ISBN: 978-4894538047). This overall index takes into account route-finding, altitude, ascent in vertical gain, time on the mountain, and technical aspects.